Professor of Humanities Jerome Neu will celebrate the publication of his new book, "Sticks and Stones: The Philosophy of Insults," with a book reading and signing at the Bay Tree Bookstore on Thursday, January 31, at 2 p.m.
What kind of injury is an insult? Is its infliction determined by the insulter or the insulted? What does it reveal about the character of both parties, as well as the character of society and its conventions? What is its role in social and legal life? How ready should we be to forgive? 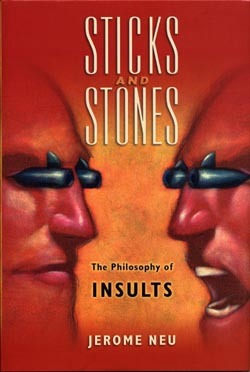 Those questions and more are posed by UC Santa Cruz professor of humanities Jerome Neu in his new book, Sticks and Stones: The Philosophy of Insults (Oxford University Press, 2008), as he explores the nature, purpose and ultimate effect of insults. Employing a wide range of examples-from Aristotle and Shakespeare, to Don Rickles and Eminem, to international politics and modern rap music-Neu examines how notions of insult shape our beliefs about character, honor, free speech, social interaction, and law. Drawing from a multitude of disciplines including philosophy, psychology, anthropology, linguistics, and legal studies, Neu illustrates how the assertions and assumptions of dominance implicit in insults constitute a serious and critical form of power play. As Neu notes in the book's foreword: "To find guidance on how to live in the world with the many others who impinge on our boundaries, to think about how much we should put up with those who would put us down, it is necessary to explore the nature and place of insult in our lives." Sticks and Stones includes chapters on the language of abuse, insult humor, emotions generated by insults, and legal issues such as obscenity, hate speech, libel, slander, and blasphemy. He notes that the perennial schoolyard addage: "Sticks and stones may break my bones, but words will never hurt me" may sound true, but it's actually false. In the real world, words do have significant effects, and Neu contends that the popular as well as the standard legal distinctions between speech and conduct are themselves troubled. He points out that there are large theoretical issues related to freedom and limits of speech. "The regulation of hate speech on a university campus, for example, is a genuinely difficult business, because hate speech can be truly harmful and disrupting to an academic environment," says Neu. "On the other hand, who are you going to shut up and what words are you going to outlaw? Most existing hate speech regulations focus on obscene and racial slurs, but polite speech can be equally-if not more-hurtful." "The truth is, when discussing controversial issues, people's fundamental views may come under assault," Neu adds. "But it's the function of the university to have students' fundamental views subjected to critical scrutiny, so a certain level of discomfort may be essential to the process. And it is dangerous to forbid certain speech because of the experience of history--there are no limits in the end to who gets shut up." Neu found no shortage of material to draw on for the book, touching on topics such as the recent uproar over the publication of Danish cartoons depicting images of the Islamic Prophet Muhammad, the European institution of dueling and honor, the origin of rap music in underground insult contests in the black community, and the sexual component of certain types of insult. "The last chapter is about forgiveness and how much toleration we should give and expect from others" says Neu. "Hopefully a better understanding of the nature and sources of insults will put us in a better position to think fruitfully of our own interactions with others." Neu joined the faculty at UC Santa Cruz in 1972, where he teaches courses on Freud for the Psychology Department, philosophy of law for the Legal Studies program, as well as various classes for the Philosophy Department. His previous books include Emotion, Thought, and Therapy and A Tear is an Intellectual Thing: The Meanings of Emotion. He is also the editor of the Cambridge Companion to Freud.